Mounted, framed and glazed with UV resistant Plexiglas. Size overall: 47 x 35 inches (120 x 90 cms). Held in 1979 at Londonâ’s Royal College of Art,’The Amazing Bugattis’ exhibition showcased the genius of the entire Bugatti family – furniture and silver by Carlo Bugatti, sculpture by Rembrandt Bugatti, and of course the automotive masterpieces of Ettore Bugatti, and his son Jean. 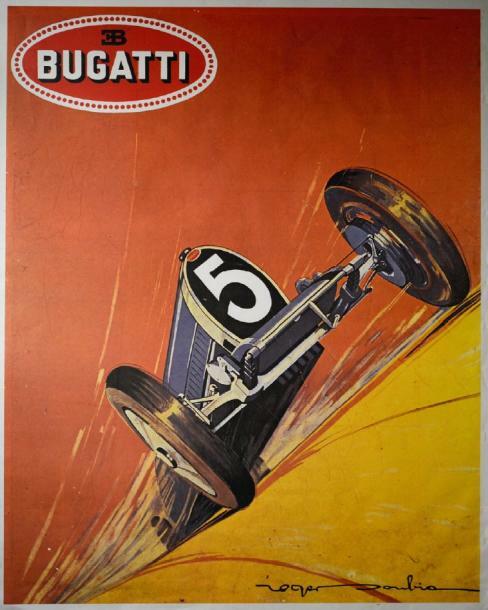 This, the rarest of the handful of Bugatti posters by Roger Soubie, it was originally commissioned by Ettore Bugatti in 1924 and was re-edited in a small, second edition for the 1979 show. Only a small number of these correct pieces now exist. A perfect framed example offering a Lucrative investment.